The latest marine wave painting is finished. I had hoped to finish this oil painting by mid October but all the fine details in the water took an extra 2 weeks to complete. This 16″x 20″ original oil on canvas is available to purchase and will look great in any interior setting. As you can see this wave painting features blues, browns and green colors with blue being the predominate color. This painting has a nice solid, richness feel when it is up on the wall. Back in the post on October 1st I showed how I was leading your eye into the painting using the lighter values in the foamy white water. I tried to maintain that “S” curve that leads from the bottom center up to the left around the rocks and then back toward the breaking wave. After laying in the choppy water details I kept building layers of paint until I finished with final glazing in the water. I used a Liquin medium to thin the oil paint for glazing, sometimes I use a Gamblin medium. Below is the unfinished image of the wave painting. There was a lot of detail in the rocks and the water that is spilling over the rocks and back into the water. The water spill-offs follow all the crevices and cracks in the rocks. I finished by glazing over the rocks to make them look more like a group instead of individual rocks. 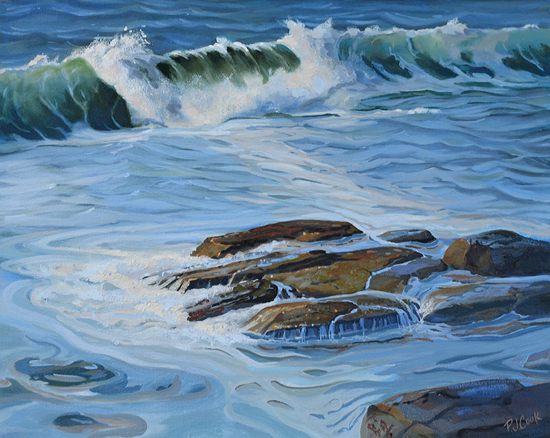 Thanks for reading about my latest seascape wave painting. Leave a comment below with any questions or use any of the other social media links below. 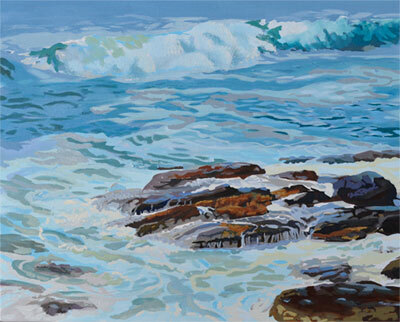 Check back to follow along as I work on a colorful sunrise oil painting of a wave breaking at the sandy beach.